Measurements of the collective public mood derived from millions of tweets can predict the rise and fall of the Dow Jones Industrial Average up to a week in advance with an accuracy approaching 90 percent, Indiana University information scientists have found. Researchers at IU Bloomington's School of Informatics and Computing found the correlation between the value of the Dow Jones Industrial Average (DJIA) and public sentiment after analyzing more than 9.8 million tweets from 2.7 million users during 10 months in 2008. Using two mood-tracking tools to analyze the text content of the large-scale collection of Twitter feeds, Associate Professor Johan Bollen and Ph.D. candidate Huina Mao were able to measure variations in public mood and then compare them to closing stock market values. 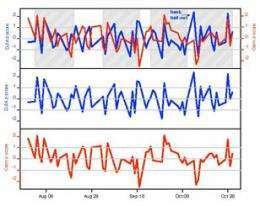 The researchers then correlated the two sets of values -- Dow Jones and public mood -- and used a self-organizing network model to test a hypothesis that predicting stock market closing values could be improved by including public mood measurements. "We were not interested in proposing an optimal Dow Jones prediction model, but rather to assess the effects of including public mood information on the accuracy of the baseline prediction model," Bollen said. "What we found was an accuracy of 87.6 percent in predicting the daily up and down changes in the closing values of the Dow Jones Industrial Average." By implementing a prediction model called a Self-Organizing Fuzzy Neural Network (SOFFNN) similar to one already used to successfully forecast electrical load needs, the researchers were able to demonstrate that public mood had the ability to significantly improve the accuracy of the most basic models currently in use to predict Dow Jones closing values. Bollen described this particular SOFFNN as a five-layer hybrid neural network with the ability to self-organize its own neurons during a learning process that included information of past Dow Jones and public mood time series values. "Given the performance increase for a relatively basic model such as the SOFNN, we are hopeful to find equal or better improvements for more sophisticated market models that may in fact include other information derived from news sources and a variety of relevant economic indicators," he said. The researchers found the OpinionFinder positive/negative sentiment input had no effect on prediction accuracy, while the Calm and the Calm-Happy combination of the GPOMS had the highest prediction accuracy. "In fact, the calmness index appears to be a good predictor of whether the Dow Jones Industrial Average goes up or down between two and six days later," Bollen said. The odds of the prediction accuracy rate of 87.6 percent being sheer chance were then calculated for a random period of 20 days and determined to be just 3.4 percent. More information: The research paper is available for download here. Ah, of course, the solution to the recession is making people happy! ... but how do we make them happy? By giving people more money. But on the road through a recession there are fewer jobs available... less money to give. Crap taco. Ah, this is a prediction algorithm system based upon a variant of the wisdom of the crowds concept. Usually systems like this only work during a specific time interval since all kinds of feedback loops kick in after a certain amount of time. I still like the one that says the Dow rises and falls with hem lines. Gives me an excuse to look. "can predict the Dow Jones Industrial Average with an accuracy approaching 90 percent"
So Indiana University scientists already millionaires? Being able to predict the average wouldn't necessarily allow you to make money, except possibly by buying and selling Gold repeatedly. If the DOW average is expected to be up, then normally Gold would be expected to be down. If the average is expected to be down, then Gold would normally be expected to be up. Else, they might profit marginally by investing equally in all DOW companies if they think it is supposed to rise. You can predicte the average based on mob mentality, but you can't necessarily predict changes in indiviual companies. you can just buy an ETF for the Dow Jones, or S&P 500, whichever index you prefer. An ETF is similar to an ordinary share, but represents holding all the companies in a given index with the weights prescribed by that index. So in effect, you can buy the Dow very easily. and what about Doe futures? Having looked at the charts above, I think that, the chief difficulty would be in sizing and timing exits... as usual.